This retrospective of Frank Stella surveys the career of this towering figure in post-WWII American art. 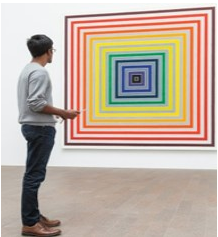 Fifty works, including paintings, reliefs, sculptures and maquettes, are displayed, representing Frank Stella’s prolific output from the late 1950s to the present day. This will be the first comprehensive U.S. presentation devoted to the artist since 1970. Brunch at the Museum will follow the guided tour.